I FIND THE best way to avoid stress when driving is to take public transport or better still, walk. That way I can nearly totally avoid other motorists – the cause of most of my stress. However, I know that this isn’t totally practical to for a lot of people, so to help you chill out behind the wheel and to make sharing the road with others a little bit more tolerable here are some tips that I find help me to stress less behind the wheel. Create a playlist of your favourite songs or types of music. Music is a great stress buster and that is a fact. Scientists have shown that music can change your mood whilst driving and classical music, in particular, can calm down listeners, promote relaxed behaviours and reduce road rage. A nice relaxing playlist of songs you like (that’s the important bit) will do wonders in helping you drown out the honking horns, revving engines and awful music coming from other cars. Just make sure you don’t have the volume too loud as this can drown out the sound of sirens. I find listening to audiobooks is also very relaxing and they help take my mind off the terrible traffic and help my journey to go quicker. Having a map or sat-nav directions of where you are going is a great way of reducing stress. You don’t need a sat nav in your car, just use Google or Apple Maps on your phone and turn on the audio so you can hear the directions – remember, it is illegal to use a mobile phone when driving. Knowing how long it takes to get somewhere and leaving enough time to get there will also make your trip less stressful. Rushing is guaranteed to make you scream abuse at the other cars on the road that are getting in your way and making you late! When rushed, we may take extra risks or speed to make up time. Speed is the single biggest factor contributing to road deaths in Ireland. The sat nav in your car or on your phone will give a rough estimation of how long it should take to reach your destination, but this is Ireland and places always take longer to get to as you are bound to get stuck behind a scenic driver or tractor. Or, if you are driving in Dublin or Cork, you’ll just get stuck in traffic no matter what time you hit the road or what route you take. So, leave plenty of time so you can have a leisurely drive. One of the greatest resources to drivers in Dublin is the Live Drive programme on Dublin City 103.2FM. From 7-10am and then again from 4-7pm Monday to Friday the programme is broadcast live from Dublin City Council’s Traffic Control Centre and gives a running commentary on the traffic as it happens. You can then change your route, avoiding the hotspots and the presenters will also tell you alternative routes and places to avoid. It is so helpful. Nothing gets my stress levels up more than searching for a suitable parking space when so many people in this country take up at least two space with their tiny city cars. When I do find a space, the last thing I need is the cortisol inducing act of having to dash to a shop to try and get change to feed into the on-street parking machine. Sure, I’ll be clamped or fined by the time I get back. Having the Park by Text app allows me to pay for my parking using my phone and I can do it before I even leave the car. I can then pay for parking at over 300 locations across Ireland and reduce my risk of getting clamped. 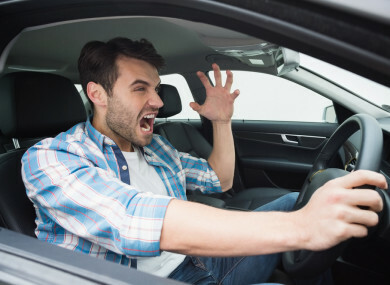 Email “Stress less: 4 tips to reduce your rage behind the wheel”. Feedback on “Stress less: 4 tips to reduce your rage behind the wheel”.